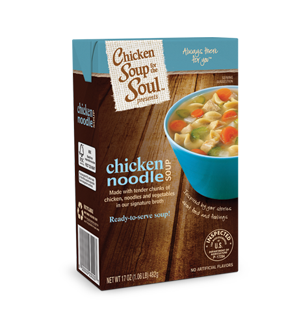 The ABCD Diaries: Chicken Soup for the Soul Introduces Comfort Foods Line! Chicken Soup for the Soul Introduces Comfort Foods Line! Chicken Soup for the Soul is excited to announce their new line of comfort foods that recently hit store shelves! 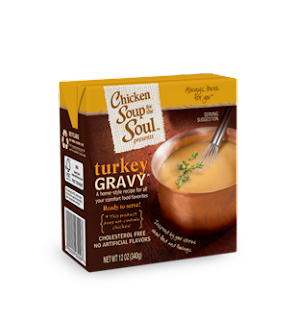 We reviewed the Chicken Noodle Soup and the Turkey Gravy. Both were delicious! Full of real, homemade flavor, they were the perfect addition to our menu. The turkey gravy was so yummy over mashed potatoes and roasted turkey breast. The Chicken Noodle Soup was full of chunks of chicken, hearty noodles and big pieces of veggies...yummo! ABCD Diaries gives these tasty comfort foods from Chicken Soup for the Soul an A+!